M won’t be the only artificial intelligence on Facebook Messenger. Facebook has given some developers access to an unannounced Chat SDK that allows them to build interactive experiences and “bots” in Messenger for shopping, booking travel, and more, sources with direct knowledge of the SDK confirm. Facebook hasn’t publicized any of the documentation for the Chat SDK, which is currently being shared with developers through PDF documents. The project is in part led by Facebook Messenger’s head of strategic partnerships Bryan Hurren. Facebook declined to comment. While it’s only in limited release right now, the Chat SDK could flourish into a more open platform beyond its early big-name partnership experiments like Uber. At first it might seem odd that Facebook would help developers build Messenger bots that might compete with its own hybrid human/AI assistant. But one of the big goals of M is to differentiate Messenger as a chat app with super powers, and make it what people want to use for everyday communication instead of SMS or other competitors. By nurturing an ecosystem of chat bots, Facebook could get outside developers to enhance Messenger’s value and make it more addictive. That way users stay in Facebook’s family of apps, where they’re more likely to be exposed to ways Facebook earns money and delivers connection. 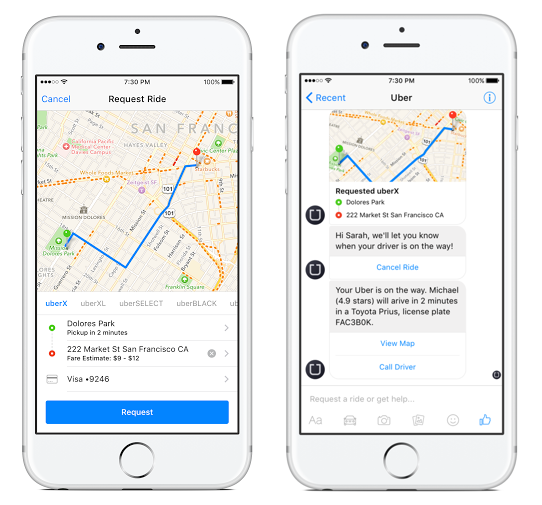 The Messenger Chat SDK could get more developers the ability to build bots like Uber’s. The concept of lightweight chat-based interfaces for commerce, news, and more was pioneered and popularized in Asia by apps like China’s WeChat and Japan’s Line. Rather than forcing people to download entire apps for each business or use case, they can simply send messages “official accounts” or chat bots inside the instant messaging app they already use all day. These allow you to make purchases with a WeChat -connected payment option, order a taxi, buy movie tickets, pay bills, and more. These bots and official accounts make accessing added utility not only convenient for the user. Chat app platforms relieve businesses from having to build, popularize, and maintain whole mobile apps for multiple phone operating systems. With so many apps flooding the app stores, getting people to discover them and go through the hassle of installing an app can be tough for businesses. It’s much more casual and less daunting for businesses to get users to simply message them. The more useful features developers and businesses build into Messenger, the stickier it gets. It’s a similar strategy to Slack, which formally launched its workplace chat app platform last month. Previously Facebook has worked with specific partners to build bot-like integrations for Messenger, but they were rather controlled experiments with big names. We broke the news last year that Facebook would turn Messenger into a platform for full-scale apps like Giphy and PingTank For Messenger, which help users make rich media content to send friends. But at the launch at Facebook’s F8 conference, it also unveiled its Businesses On Messenger platform for allowing companies to offer real-time customer service via chat, plus receipts and ways to change orders. Its initial partnership with Everlane showed customers able to chat with someone to get their shipping address changed, and take care of all the confirmations in the chat thread rather than by email. Since then, Facebook hasn’t talked much about Businesses On Messenger, as focus shifted to the limited launch of then Facebook M assistant. Meanwhile, it built a way for users to get real-time World Series baseball updates from the MLB, and get price quotes on handywork and connect to contractors from Pro.com. TechCrunch was tipped off about one more curious thing Facebook has done in Messenger. For some users, entering the @ symbol at the start of a message brings up a “Command” menu with just one option called “Holiday Challenge”. It seems Facebook is testing in-line bots similar Telegram and Kik in addition to full-fledged bot accounts built through the SDK. Last month, Facebook finally showed off the real potential of bots on Messenger with its Uber integration. Tap the Transportation button or an address and select Uber, and you’ll start a chat thread with the car service. An interactive panel in the chat lets you set your pickup point, destination, and payment option. You’ll then get updates in the thread as the driver approaches, with options to view a map or call the driver. Bots built with the Messenger Chat SDK will look and work similar to these screenshots. They’ll be immediately messageable without having to Friend or Like them. The bots can react to taps on interactive buttons or keywords typed into the thread. Sockets technology will allow them to respond in real-time Rather than seeing M as a competitor to developers’ apps, Facebook could use it to test and experiment with what people want and what’s possible with bots on Messenger. On the web, keyword search was the core of the experience. But on mobile, it’s become clear that chat is where people spend most of their time. That makes winning the messaging war both a requirement and an opportunity for Facebook. To stay dominant on phones, it must make Messenger irresistibly useful, and the best way to do that is to augment its own product with bots from developers that offer convenience and utility for every niche use case. If Facebook controls messaging, it controls the portal to commerce and content as well as communication. Suddenly it makes more sense that Mark Zuckerberg’s 2016 challenge to himself is building an artificial intelligence assistant to run his house like Iron Man’s Jarvis. “I’ll start teaching it to understand my voice to control everything in our home — music, lights, temperature and so on” he wrote. He too is building a bot that responds to natural language. Before the Uber integration launch, Facebook Product Manager Seth Rosenberg told TechCrunch “We’re just getting people used to the idea that you can message more than just people on Messenger.” The Chat SDK could bring those people more to message.